NetEnt slots are some of the more interesting around, with the Turn Your Fortune slots living up to this expected level. This slot online glimmers and glitters, has a trio of bonuses that are as innovative as they come and can send the senses whirling with little effort! Check it out to the full below. 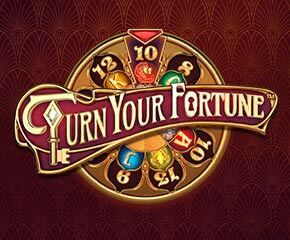 Turn It In With The Turn Your Fortune Slots Online! Turn Your Fortune slot features the standard 5 reels, as well as 4 rows and a generous 40 paylines. The reel set is pretty much traditional but has a fair amount of bling. There’s a gold-coloured cylindrical barely prominently displayed at the left part of the reels in Turn Your Fortune slots. Playing card values are present, with the higher values consisting of very vividly decorated animals like a fish, turtle, owl, seashell and a lion. The latter happens to be the most valuable of all icons, seeing that it pays out 10x the stake anytime 5 of it appears on an active payline. All icons within view are additionally capable of landing fully stacked on the reels. A wild and scatter makes their separate appearance, with the former able to appear on any reel position and fully capable of replacing all other icons in view apart for the scatter, +10 icons and key icons. Re-spins Feature – this is triggered when at least a couple of the scatter icon appears on reels 1, 3 and 5. The golden barrel featured at the left is then brought into play. It shows 5 coin win levels, with progress up this being possible when the players fill up the Fortune Wins meter by landing a distinct collectable icon. The max possible win here is set at 2,000x the stake. Free Spins – this feature is triggered by the appearance of a trio of scatter icons. A 3-tier free spins wheel is then unveiled that decides how many free spins will be awarded, the collectable icon given and the level of the Fortunes Wins players will be rewarded with. Extra free spins can be accessed from within this bonus round by landing scatter icons. 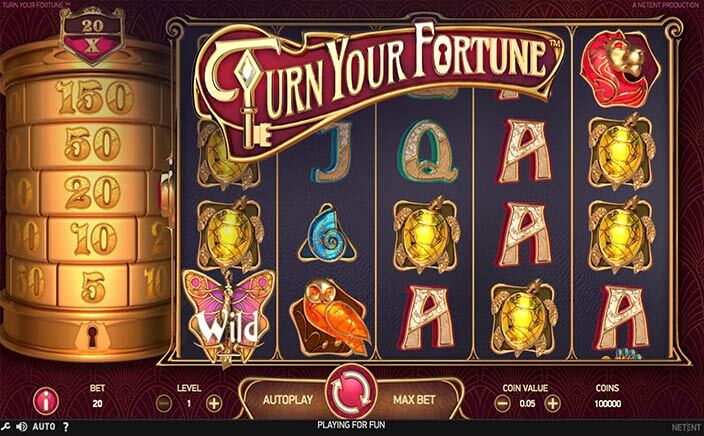 The Turn Your Fortune slots presents some interesting possibilities and appears to be worth cuddling up to! Eye-catching graphics, innovative gameplay, rewarding bonuses and more make this a game anyone could play.